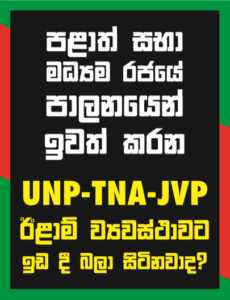 United National Party (UNP) parliamentarian John Amaratunga was today appointed President of the Jathika Sevaka Sangamaya (JSS) by UNP Leader Ranil Wickremesinghe. The late Dr. Jayalath Jayawardena was its former president. A rally organised in Maharagama today by the National Collective (Jathika Ekamuthuwa) which was a joint venture of the Jathika Sanga Samelanaya (JSS) and the Bodu Bala Sena (BBS) to press for the abolishment of the Provincial Council (PC) system in Sri Lanka.